Erie Insurance recently published a blog post on ten maintenance-related things you can do to help your home recover from the winter months. With yesterday being the first day of spring, we thought we’d share the list with our readers. Fix any ceiling stains, which usually indicate a roof leak. But, remember to fix the leak first! Inspect windows and doors. Look for bent or broken hinges, frames, or edges. Also look for holes in screens. Consider resealing your driveway. Particularly if you notice cracks. Seal your deck every few years. Check your fence(s). Repair or replace any loose slats or rot on your fences. Check for ice dams. You may want a professional to check and fix ice dams on the roof. Apply caulk to leak-prone areas. Let us help you detect water damage in your home before it’s a major loss. How? 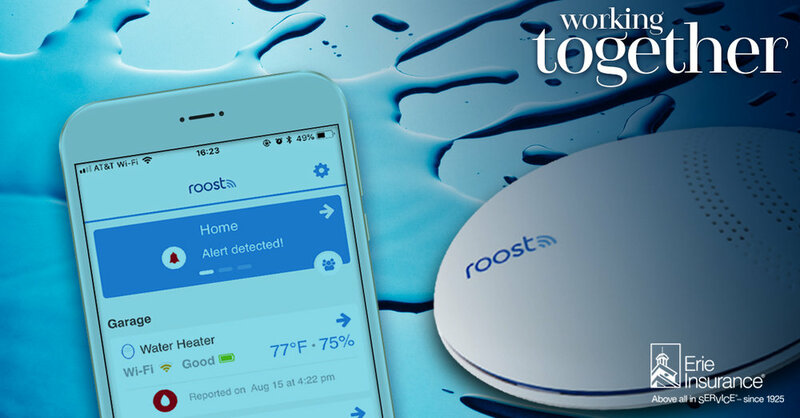 By offering you a free Roost Smart Water Leak and Freeze Detector. After you download the app, you’ll be able to receive notifications on your smartphone if your home is experiencing water, temperature or humidity problems. This small device could help prevent a big loss. Contact our agency today to find out how to get yours. Erie Insurance published a helpful article on its blog, ErieSense, on how to prevent your pipes from freezing this winter, and what to do if it happens. I am re-posting the tips below. But, I wanted to highlight one of the most important things the article mentions. If your pipes do freeze, call a plumber to help you thaw them safely and avoid further damage to your home. It may seem intuitive, but it's worth reminding folks they do not have to handle this situation on their own - call a professional to help you winterize your pipes, or thaw them, if you've run into that problem. Check out Erie's full blog post for signs that your pipes are frozen and tips for thawing them yourself: https://www.erieinsurance.com/blog/frozen-water-pipe-prevention. We've seen an increase in the number of our clients who have decided to rent their houses out, rather than sell them. If you plan to do this, it's important to adjust your home insurance policy to be sure you are properly protected. First, you will want a renters policy, which will protect your home's structure and the small amount of personal property (furniture, decor, etc.) you may have inside the home. You'll also receive liability coverage, in the event that someone is injured on the property. But, almost more importantly, carrying a renters policy as a landlord will provide protection if there is a home claim that prevents your renter from living on the property for a time. In this case, your renters policy would provide up to 12 months of fair rental value. This means during the time the house is out of commission, you will not lose the rental income that typically comes from your renter. Once you become a landlord, it is also important to talk to your renter about carrying his/her own renters policy. This protects a renter's personal property, and provides important liability coverage to your tenant. It might also be beneficial to be listed as an additional insured on your tenant's policy, which provides you an important line of sight to his/her policy and coverages. Give us a call if you have questions about renters or tenant policies. Earlier in the month, HuffPost published an interesting article (link here) on how our credit scores impact our homeowners insurance premiums. The article dissects a study completed by Quadrant Information Services. It's probably not surprising that the study found there is a direct correlation between a poor credit score and a higher homeowners insurance cost. What surprised me, however, was just how much higher your insurance premium could be if you have a lower credit score, when compared with someone who has a high score. According to the article, "The study found that if you have a fair (i.e. median) credit score, you may pay 36 percent more for home insurance than someone with excellent credit. That’s up from a 32 percent increase in 2015 and 29 percent in 2014." So, not only are you paying more for home insurance if you have an average credit score, but exactly how much more is increasing over the years. "What’s more, if you have poor rather than excellent credit, your premium more than doubles, increasing by an average of 114 percent (up from 100 percent in 2015 and 91 percent in 2014)," says the article. What percentage more you will pay if you have less-than-stellar credit varies state-by-state, with some states weighing a credit-based insurance score more heavily than others. The article lists the states that place the most importance on credit score, and explains what goes into calculating your credit-based insurance score. The article also discusses why insurance companies use credit-based insurance scores. In short, credit scores are predictive of loss behavior. Meaning people with lower scores tend to have more insurance losses. Interestingly, there are three states, California, Maryland and Massachusetts, that ban the use of credit in setting home insurance prices. The article discusses the arguments against using credit score in insurance. The top arguments against this practice: (1) it is unfair to consumers in lower socio-economic demographics, and (2) "there’s no uniformity or standardization to how this data is used" since different insurers weigh credit scores differently. Meaning some may consider them heavily, while others don't. 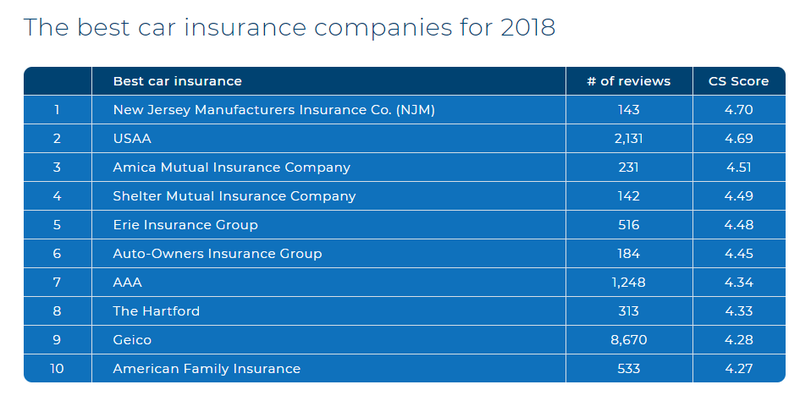 Since we are all consumers of insurance, in some way or another, I think it's a very worthwhile read to better understand what may impact your premium, and what is happening in the insurance industry at large. In this heartbreaking article on msn.com (link here) , a fire destroyed a Canadian man's uninsured $3 million car collection. The cars were kept in a barn, which caught fire and was completely demolished. The man said he lost 45 years worth of work, more than 40 classic vehicles, and 40 collectible tractors. This loss goes beyond the monetary value of the collection. It's obvious this man invested so much time and energy into his collection. To lose it is a hit on many levels, I imagine. If you have collectibles, whether they are cars or other items, such as jewelry, firearms, art, trains, etc., you should talk to your insurance agent about scheduling coverage for them. Most homeowners policies give you a designated amount towards some of these items, but, usually, it's not enough to replace an established collection. When you schedule coverage, you can value the collection and receive coverage commensurate with that amount. The other benefit of scheduling coverage for collectibles, if there is a loss, you are not subject to your homeowner's deductible. Certainly, in the event of a claim, a check from your insurance company can not replace the emotional loss. But, it can help you with the financial burden. I'd like to use today's blog to remind my clients, and anyone who has insurance, that there are a handful of times when it's absolutely necessary you pick up the phone and contact your agent. If you have made any of the changes listed below, or have been involved in a claim, it's so important to get the details to your agent. Regarding the situations below, if you don't inform your agent, you may not be covered by your insurance policy. A Change of Address - Without the proper address on file, your insurance company may be sending critical communication to the wrong location. Even if you do not receive these communications, you are still responsible for the information detailed inside. Additionally, if you have homeowners or renters insurance, you want to be sure your policy is set up to protect the correct property. Finally, counties and cities have different insurance ratings, meaning if you move and don't inform your agent, you could be missing out on savings. It's your responsibility to inform your agent of a change of address. Additional or Replacement Vehicles - When you replace one vehicle on your policy with a new one, or if you plan to add another vehicle, it is crucial that you inform your agent. Generally, in Pennsylvania, it is your responsibility to inform your agent of an additional vehicle within 14 days. While you get a bit longer to report a replacement vehicle. I tell my insureds to report either as soon as possible, to avoid issues with coverage. One thing to note here - many people think when they purchase a new vehicle the dealer will contact their insurance company. This does happen in some cases; but, it is the insured's responsibility alone to report new and replacement vehicles to insurance. Don't rely on your car dealer to add a vehicle to your policy. Adding or Excluding Drivers - If you have someone who is regularly driving your car, or if there is someone prohibited from driving it (called an exclusion), you need to inform your insurance agent. In the event of an accident, without the proper drivers listed on the policy, coverage may be denied. Structural Changes to a House - Putting an addition on your home? Installing a pool? Any structural changes to your home need to be detailed in your insurance policy. These changes can affect the value of your home, and can mean it's time for new or additional insurance coverage to protect your family. A Claim - If you've had a home or auto claim, involve your agent. Your agent is your insurance advisor and can help you through the process. Including your agent is about more than just getting your claim reported. An agent can guide you through the claims process, and can act as your advocate with the insurance company. It's unfortunate that more and more of us either know someone who has been the target of identity theft, or have experienced it firsthand. It seems every time I watch the news there is another warning about a new scam to steal your personal information, gain access to your money, or even hijack your house using Internet-connected devices. It's become such a problem, that insurance companies are taking notice, and most have realized that insureds need protection. Erie Insurance has an endorsement that can be added to a homeowners policy called Identity Recovery, which can help customers gain protection. Identity Recover works to restore your credit history, and provides up to $25,000 worth of coverage for both fraud and expense reimbursement. This means fraudulent charges to credit cards or bank accounts; the cost to refile applications for loans or other credit instruments; certain legal fees; and even miscellaneous expenses associated with recovering your identity can be covered by this endorsement. Additionally, through this endorsement, Erie has case management specialists that can assist you in restoring your identity by: contacting credit bureaus to place a fraud alert on the credit file; ordering copies of credit reports to review recent activity; and even closing suspect accounts that may have been tampered with or fraudulently opened. Honestly, it's a really nice piece of coverage, and I feel it's worth your while to talk to your agent about it. Today, so many of our personal details, accounts, and devices can be accessed via the Internet. It's important to protect yourself from identity theft. Home insurance policies cover different causes of loss (i.e. hail, fire, windstorm, etc.). An insurance policy that covers all causes of loss, except those specifically listed as an exclusion, provide what is called comprehensive or open perils coverage. Policies may be written in different ways and with different loss coverage. It's best to speak with your agent if you have questions about your specific policy and what it protects against. Reporting a claim is not always as simple as calling your insurance company and receiving compensation. Claims, whether they are small or large, affect your insurance policy. Below are five things I recommend my insureds consider before reporting a claim. I point these items out because it’s important that customers understand when and why they should report a claim. Educating yourself about the claims process means being a savvier insurance consumer. 1. Report the claim immediately to your insurance agent or company. The official guidelines for reporting a claim differ from company to company, so it’s important to check in with your agent or insurer to understand how quickly you need to report a claim. However, as a good rule, it’s important, whichever company you are with, to report claims as soon as they happen. This leaves less chance that details will be forgotten, and reduces the chance that there will be any questions about the claim’s authenticity from your insurance company. 2. Is the claim cost larger than your deductible? If the claim is not larger than your policy deductible, there is really no reason to report it. In this case, you are financially responsible for the cost of the repair, and there is no benefit to involving the insurance company. You don’t want a reported claim on your policy when you aren’t receiving any financial assistance from your insurance company. 3. Can you handle the claim financially? Simply put, insurance policies aren’t home- or car-maintenance accounts. Insurance is for catastrophic losses. Or, in other words, losses that create a significant financial hardship. Though insurance will pay for minor claims, you may end up hurting yourself in the long run, as multiple claims will drive up the policy premium. This means you pay more for your insurance plan each year. Additionally, multiple claims increases the likelihood that your insurance company could cut your policy altogether. 4. Often claims raise the annual premium of your policy. Though many companies today have accident or claim forgiveness, which means your rate won’t increase for your first claim, it is important to understand how claims generally affect your overall policy premium. The number of claims reported, along with the severity of each, can adversely affect the total price you pay for insurance. 5. Claims stay on your policy record for a specified period of time. Auto claims typically stay on your record for three years. Home claims stay on your record for five years. Having claims on your policy record can affect you when you shop for insurance. They often make it harder to receive the best possible rate, and certain companies will not accept new insureds with multiple claims. There is much to consider when deciding whether to report a claim. The best advice I can give is to talk to your agent about each claim. Agents are there to provide you with guidance and education, as well as help you through the claims process. Knowing all the facts can help you make a smart financial decision.